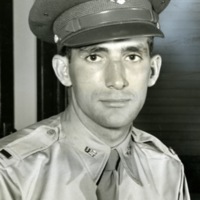 Photograph of David A. "Doc" Maffit --Ice Barn--1888; located on the Sangamon river. 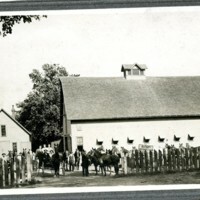 Maffit in horse and buggy on left, with lots of horses and wagons. St. Louis R.R. Bridge, Decatur, IL. 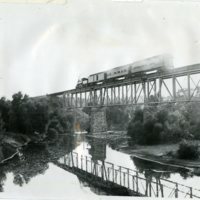 Photograph of a steam engine pulling cars on the St. Louis Railroad bridge over the Sangamon River, Decatur, IL. 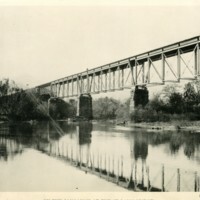 Photograph of the St. Louis Bridge taken in 1896 from the Sangamon River. The other photo is a close up of the bridge. 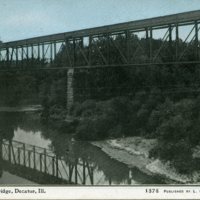 Photograph of a covered bridge over the Sangamon River. Photo by Noel C. Dicks, Arthur, IL. 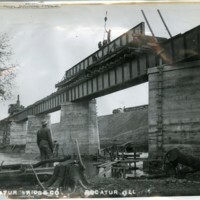 Photo of County Line Bridge on the Sangamon River. 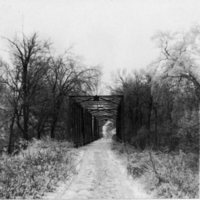 Photograph of the County Line Bridge that crosses the Sangamon River, trees are covered with sleet. 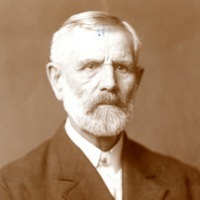 Photograph of Thomas L. Antrim. 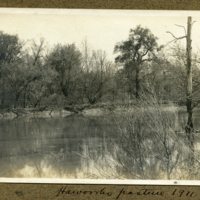 He owned an ice business on E. Decatur St., where he cut and sold natural ice from the Sangamon River. 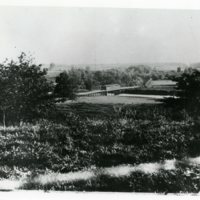 The photo was taken by Vandeventer of Decatur. 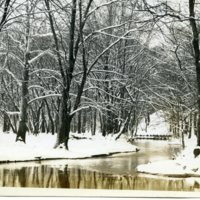 Photograph of the Sangamon River in the winter.